Each year, thousands of underage drivers are injured or killed in alcohol-related auto accidents. In an effort to reduce these numbers, the laws regarding underage drinking have grown much tougher over the past few years. Yet despite the crack down on drunk drivers, more and more underage motorists find themselves facing criminal charges for driving under the influence (DUI)—and in most cases, they are arrested after failing one or more underage field sobriety tests. If an officer suspects that you may be driving under the influence of alcohol, he or she may administer a field sobriety test to determine your level of impairment. Although these tests involve performing a series of seemingly easy exercises—such as standing on one foot or walking an imaginary line—they are actually designed for failure. According to the National Highway Traffic Safety Administration (NHTSA), there only are only three field sobriety tests that have been approved for identifying drunk drivers; these three exercises, which are referred to as “standardized field sobriety tests,” are the one-leg stand, walk-and-turn, and horizontal nystagmus test. However, many officers continue to use other field sobriety tests that have not been approved by the NHTSA (such as counting backwards, reciting the alphabet, or touching your nose with your finger). 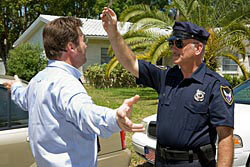 Regardless of what type of field sobriety test you are given, your results will be based on highly subjective information—namely, the officer's observations and personal opinion. Unfortunately, since the mere fact that the officer asked you to perform the test indicates that he or she already suspects you are under the influence of alcohol, most drivers who perform field sobriety exercises are ultimately arrested and charged with drunk driving.